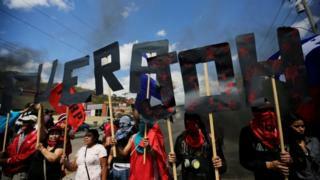 Anti-government demonstrators in Honduras have clashed with riot police during protest marking the first anniversary of the inauguration of President Juan Orlando Hernández. Thousands of people took the streets in the capital, Tegucigalpa, and across the country, demanding his resignation. Mr Hernández, a conservative pro-US politician, won re-election in 2017 by a narrow margin. The opposition has accused him of electoral fraud. "There are people who have been gassed and beaten," said the opposition leader and former President, Manuel Zelaya. Mr Hernández, who is widely known by his initials, JOH, has repeatedly denied allegations of irregularities. He defeated the popular television presenter, Salvador Nasralla, by 1.53 percentage points. Mr Hernández stood for office after the Supreme Court controversially lifted a constitutional ban on re-election. The opposition contested the electoral process and challenged his victory. But the result was confirmed by the Honduran electoral court almost a month after the vote, following a partial recount. During Sunday's protests Mr Hernández was at a Catholic youth meeting hosted by Pope Francis in Panama. He met the Pope and asked him to include Honduras in his prayers. Honduras is one of Latin America's poorest countries and has one of the world's highest murder rates. Thousands, escaping poverty and gang-related violence, have joined the latest migrant caravans heading towards the United States southern border.